A précis: Where are the US mappers at? : Neis One! Similar to our prior research results for the selected 12 world regions, the US urban areas showed different individual patterns. Some cities such as Fargo (ND) experienced several data imports in the past which resulted in strong data density values (Nodes and Ways), whereas other areas solely rely on a small community of volunteers and contributors. We also conducted a simple statistical analysis to evaluate whether certain socio-economic factors have an impact on the development of OSM communities in the different cities. 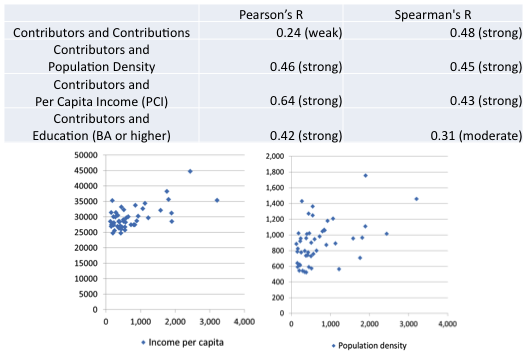 Variables such as population density, per capita income and education showed a moderate to strong correlation with contributor numbers, highlighting that all of the aforementioned factors can have an impact on the success of OSM in the selected urban areas in the US. It was also quite useful to take a look at the local contributor numbers vs. external contributors. Certain cities such as Miami (FL) heavily rely on data contributions made by mappers whose home region is more than 1000 km away, whereas other cities such as Los Angeles(CA) show large values for both, local and external mappers. You can check out your own area here too. The corresponding blog post is online here: “The OpenStreetMap Contributors Map aka Who’s around me?”. A more detailed analysis that is currently being conducted will reveal if cities that prove to have large external mapper contributions show the same quality as areas with lots of local mappers or not.